Water saturation is the ratio of water volume to pore volume. Water bound to the shale is not included, so shale corrections must be performed if shale is present. We calculate water saturation from the effective porosity and the resistivity log. Hydrocarbon saturation is 1 (one) minus the water saturation. Most oil and gas reservoirs are water wet; water coats the surface of each rock grain. 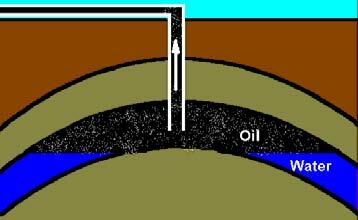 A few reservoirs are oil wet, with oil on the rock surface and water contained in the pores, surrounded by oil. Some reservoirs are partially oil wet. Oil wet reservoirs are very poor producers as it is difficult to get the oil to detach itself from the rock surface. It is fairly easy to take a core sample, clean it and dry it, then make the rock oil wet. However, reservoir rocks are seldom clean and dry, so that same rock in-situ will often be water wet. In a water wet reservoir, the water is held in place by surface tension. 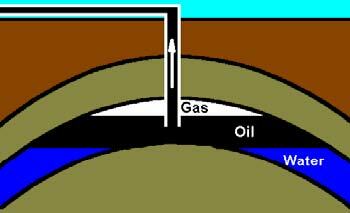 The surface water does not move while the oil or gas is being produced. This situation is shown below (left). Water wet formation with hydrocarbon before invasion (left) and after invasion (right). The same illustrations are used to describe a reservoir at initial conditions (left) and after production by aquifer drive or an efficient water flood - water moves in to replace the oil that is withdrawn (right). When a reservoir is drilled, some of the fluids near the wellbore are pushed away and the zone is invaded by the drilling fluid. If hydrocarbons were present, the water saturation after invasion will be higher than the original reservoir conditions. A shallow resistivity log will see the invaded zone water saturation. A deep resistivity log should see the original formation water saturation as long as invasion was not too deep. Production of oil or gas will often change the water saturation, but the amount of change varies with the drive mechanism. Aquifer drive (left) pushes oil up, increases water saturation as the oil is produced. Gas cap drive (right) pushes oil down, but water saturation does not change until the gas that replaced the oil is also produced. If there is no aquifer, both situations produce only by expansion drive - in this case water saturation does not change unless a water flood is imposed by the field operator. Expansion drive is also called solution drive as it is the gas in solution in the oil that pushes oil out of the reservoir. Water saturation does not change and oil recovery is very small (5 to 10% depending on gas-oil ratio and oil viscosity) unless a water flood is instituted. Gas reservoirs can produce with reasonably high recovery from pure expansion drive (Sw nearly constant), but there may also be an aquifer drive component (Sw will increase over time). Reservoir monitoring is used to assess the changes in water saturation over time. Monitoring is accomplished by periodically running appropriate logs through casing and analyzing the logs for porosity and water saturation. Changes in the position of the oil-water or gas-oil contact can lead to a workover of the well to restrict the perforated interval to reduce water or gas production. Modern technology applied to older wells may even find bypassed pay zones to find ways to improve the economic performance of the well. For a tank of water, R0 = RW. Therefore F = 1. Since PHIt = 1, then A must also be 1.0 and M can have any value. If porosity is zero, F is infinite and both A and M can have any value. 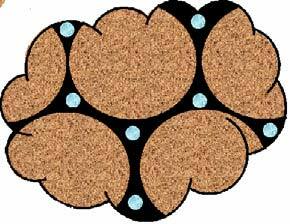 However, for real rocks, both A and M vary with grain size, sorting, and rock texture. The normal range for A is 0.5 to 1.5 and for M is 1.7 to about 3.2. Archie used A = 1 and M = 2. In fine vuggy rock, M can be as high as 7.0 with a correspondingly low value for A. In fractures, M can be as low as 1.1. In some rocks, M varies with porosity. Note that R0 is also spelled Ro in the literature. 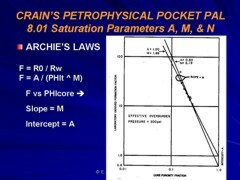 Archie used an N of 2 and the usual range is from 1.3 to 2.6, depending on rock texture. It is often taken to equal M, but this is not supported by core data in all cases. A, M, and N are called the electrical properties of the rock. They are found usually from laboratory measurements. Porosity is determined from any one of a dozen available methods. Saturation of any given fluid in a pore space is the ratio of the volume of that fluid to the pore space volume. For example, a water saturation of 10% means that 1/10 of the pore space is filled with water; the balance is filled with something else (oil, gas, air, etc. - a pore cannot be “empty”). As for porosity, saturation data is often reported in percentage units but is always a fraction in equations. Porosity is the capacity of the rock to hold fluids. Saturation is the fraction of this capacity that actually holds any particular fluid. Porosity, hydrocarbon saturation, the thickness of the reservoir rock and the real extent of the reservoir determine the total hydrocarbon volume in place. Hydrocarbon volume, recovery factor, and production rate establish the economic potential of the reservoir. Irreducible water saturation (SWir) is the minimum water saturation obtainable in a rock. Water is usually the wetting fluid in oil or gas reservoirs, so a film of water covers each pore surface. The surface area thus defines the irreducible water saturation. Formations at irreducible water saturation cannot produce water until water encroaches into the reservoir after some oil or gas has been withdrawn. 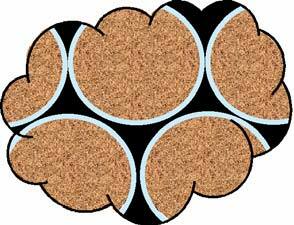 Small pores have larger surface area relative to their volume so the irreducible water saturation is higher. If pores are small enough, the irreducible water saturation may be 1.0, leaving no room for oil or gas to accumulate. The initial water saturation (SWi) is the saturation of an undisturbed reservoir with no prior production from any earlier well. Usually SWir = SWi, at least above the oil water transition zone. In the transition zone, SWa is higher than SWir and some water would be produced if the well was completed in this interval. In a reservoir that has had some production, SWa may be higher than SWir (and higher than SWi) so some water may be produced with the oil. Of the total amount of oil or gas present in a reservoir, only a fraction of it can be produced, depending on the recovery efficiency. This recovery factor, normally determined by experience, is typically in the 20% to 50% range for oil, and may be as high as 95% for gas zones, or as low as 5% in heavy oil. Recovery factor can sometimes be estimated from log data by observing the moveable hydrocarbon volume. Here are the standard definitions needed to understand this Chapter. - effective porosity, which is assumed to be the same porosity as in the un-invaded zone. The amount of free water in the invaded zone is usually higher than in the un-invaded zone, when oil or gas is present. Thus Sxo >= Swe. The water saturation in the invaded zone between the flushed and un-invaded zone is seldom used. 8: SWt >= SWe >= SWuse. All volumes defined above are in fractional units. In tables or reports, log analysis results are often converted to percentages by multiplying fractional units by 100.